WASHINGTON, D.C. -- Republicans' satisfaction with the way things are going in the U.S. took a hit since last month. Forty-one percent of Republicans say they are satisfied with the way things are going in the U.S., down 17 percentage points since May. 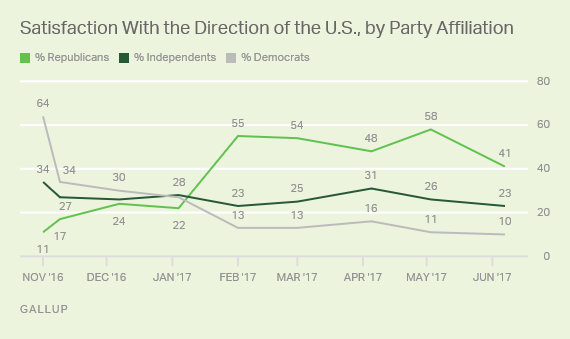 At the same time, satisfaction among Democrats and independents has remained low. Republicans' spirits received a major boost after President Donald Trump's inauguration -- their satisfaction with the country's direction registered at majority levels in three of the first four months of his presidency. The latest figure is not the first to dip below 50%, but it represents the lowest level of satisfaction among the president's party since he took office. These data are from a June 7-11 Gallup poll, during which controversy continues to swirl around the Trump administration. On June 8, the U.S. Senate Intelligence Committee conducted hearings with recently fired FBI Director James Comey. The former director's testimony left questions among some observers as to whether the president had tried to interfere with an investigation into his administration's ties with Russia. The recent drop in satisfaction among Republicans could reflect disappointment among the party over the continuing probes into Trump's administration. Republicans could also take a similar view of the president himself -- that continued attacks from Democrats and the media are hindering overall progress. Throughout the past year, overall satisfaction generally held near 30%, with two notable exceptions: a drop to 17% last July amid a series of deadly incidents involving police, and a brief surge to 37% just before the November election. 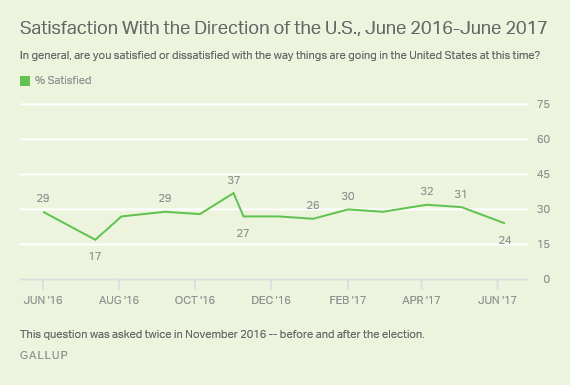 Americans' satisfaction with the direction of the country has dipped to 24% or lower at many points throughout Gallup's trend across six presidencies. Gallup began tracking the question in 1979 when Jimmy Carter was president. Ratings ranged from 12% to 26% that year amid high gas prices, a struggling economy and international strife, which foreshadowed his unsuccessful re-election bid in 1980. Amid worsening views of the economy and high unemployment, Americans' satisfaction with the direction of the country fell below the 25% mark in late 1982 during Ronald Reagan's presidency. However, it improved greatly later in Reagan's two terms as the economy recovered, reaching as high as 69% in 1986. Gallup recorded sub-25% satisfaction ratings through most of 1992, as George H.W. Bush campaigned unsuccessfully for re-election after an economic recession. This followed several years of much higher satisfaction ratings during Bush's term. Satisfaction with the country's direction was also low in Bill Clinton's first year, reaching 24% in May 1993. Ratings were just as low amid a government shutdown toward the end of Clinton's first term in 1996, but satisfaction greatly improved throughout the remainder of his presidency as the economy recovered. 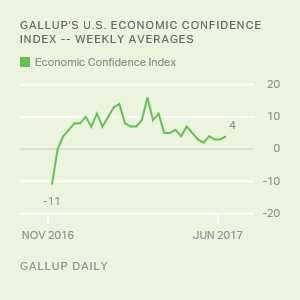 Though post-9/11 ratings under George W. Bush were among the highest in Gallup's trend, satisfaction consistently registered below 25% throughout his final year in office -- including a record low of 7% as the federal government attempted to deal with the unfolding financial crisis in October 2008. Satisfaction was below 25% for most of Barack Obama's two terms, though these ratings somewhat improved during his final two years in office. The 37% pre-election rating in November was the highest under Obama. Though certainly not welcome news to a White House in its infancy, the drop in satisfaction with the country's direction is by no means a death knell to public views of Trump's leadership. 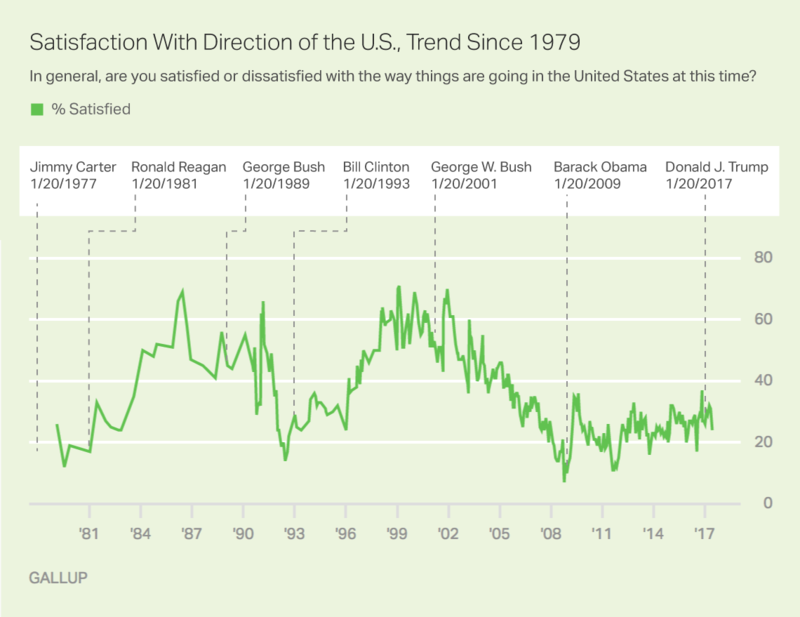 Satisfaction was at about this level at this point in Clinton's first term, and at several points in the presidencies of Trump's two immediate predecessors, satisfaction was well below the current level. History has shown that Americans' dismal views of the country's trajectory can be revived. Trump will likely struggle to improve the level of satisfaction among independents and Democrats, whose ratings remain low. Perhaps the more important challenge to the president will be resuscitating the deflated satisfaction among his own party members -- because until now, Republicans have buoyed measures of Trump's success across a variety of issues. The timing of the drop could likely be related to unrelenting probes into his administration's conduct, mainly when it comes to relations with Russia. Though the president claims "total and complete vindication" after Comey's testimony, this may not be enough for Americans who remain uncertain of Trump and his cabinet's motives and conduct. Positive feelings about the country's direction could improve if the administration finds a way to put the story and investigations to bed. But lingering questions, many generated by leaks within his own administration, could dampen any hope of renewed spirits -- including among Trump's Republican base. Results for this Gallup poll are based on telephone interviews conducted June 7-11, 2017, with a random sample of 1,009 adults, aged 18 and older, living in all 50 U.S. states and the District of Columbia. For results based on the total sample of national adults, the margin of sampling error is ±4 percentage points at the 95% confidence level. All reported margins of sampling error include computed design effects for weighting. President Trump's job approval edged down to 37% -- the lowest weekly average of his administration, by one point -- during the week ending June 11. Democrats' seven-percentage-point advantage over Republicans in party identification and leanings among Americans is the largest in over two years.